(-) 20 minutes of practice 2x/week (with accompanying #calligcast post). — Nope, this was not a twice a week occurence, especially when my supplies were packed up for over two weeks while limboing in Madrid after moving out of Montpellier. But aside from that excuse, I simply haven't made it a priority. (+) Write 1-2 more posts about values or role models. — In September I wrote about the joy of being an adult beginner, and at the start of October I wrote a response to my younger brother's post about "things I'm struggling with as a musician/human being" on Medium. After discussing my difficulties with choosing action > thought in August, the following month I started a 100-day project (100 Days of Mind Mapping), which is now a must-do each day. (Today's Day 40!) I've also recently gotten back into meditation, which I'm aiming to do for 10 minutes daily again. And a few days ago I started a "bullet journal," which is basically just a smaller version of my big "everything" notebook I'd bought last fall and had been using for monthly check lists, French to-dos, etc. 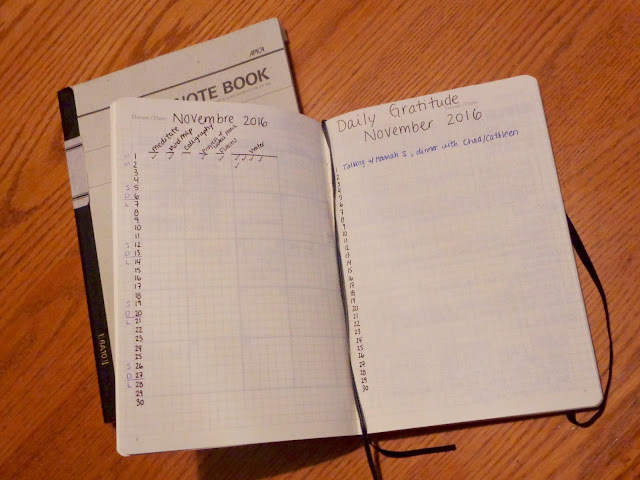 New bullet journal pictured in front of previous "Note Book." So, that's a quick update on a few of the other "things" I'll be working on this month, alongside what follows below. Take at least 100 quizzes on Progress with Lawless French (PLF) — I went ahead and bought a Premium subscription of PLF this month, so I have unlimited quizzes. I'm tracking PLF visits in my bullet journal (aiming to take 1-5 quizzes daily), and the site has awesome graphs that track progress more specifically as well. Read "Harry Potter et le Prince de Sang-mêlé" — I checked out the sixth Harry Potter book from the library the other week, but have only read the first chapter. 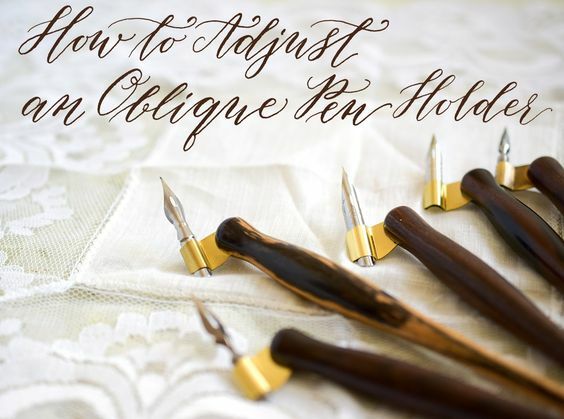 Complete Kaitlin Style video course / worksheets with oblique pen — I purchased an oblique pen upon arriving home in October (the type of pen pictured below). I've hardly used it yet, so I plan to continue doing the Kaitlin Style worksheets with it. Two weekly calligcasts — You know the drill. Write post about Rodez/OVS evening — I wrote out a quick longhand draft last month in my "Note Book." Time to type, edit, and share. Pass day 65 in my #100DaysofMindMapping project — As much as I've been despising it, this project is actually pretty good for getting me on the roads to "done > perfect" and "create > consume." I create a mind map each day, and the product is not the purpose. The purpose is the process, thus my "final product," each map, is going to be far from perfect every day. The fact that you have to do so many helps remove any pressure from even aiming towards that "perfect" direction in the first place. What's one thing you want to accomplish this month?